Discovery Academy students have the opportunity to participate in a variety of optional recreational activities that develop talent, improve fitness, build relationships, and increase self esteem. These clubs and activities give student the opportunity to learn and grow outside of the classroom. Clubs are one way in which Discovery Academy provides closely supervised co-educational opportunities for our students. These interactions provide a setting for students to practice appropriate social skills they are learning in a therapeutic environment. Because of these opportunities to practice, teens return home prepared for “real world” encounters. Our mentors serve as club advisers. Club themes are as varied as our staff. For example, past clubs have included Irish dancing, art, yoga, drama, chess and break dancing. Discovery students have the opportunity to participate in sports leagues. There are no try-outs and any student who is behaviorally appropriate may participate. 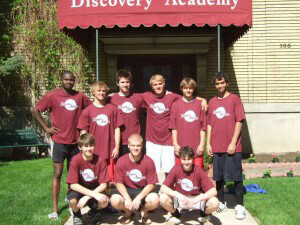 The Academy competes in Provo City recreation leagues against adult teams. Academy mentors volunteer, usually on their own time, to play with the students. Both boys and girls programs are available. Many students who would never have considered sports, dance or drama in their former schools have been delighted to participate in Discovery teams and clubs. They are willing to risk because of the relationships created with their peers and mentors. Because young people are still discovering who they are, these club activities provide an excellent opportunity to grow. Moreover, finding new interests is a good way of replacing old habits. Finally, as way of recognizing and encouraging students, the Academy offers students an opportunity to earn letter jackets for their participation in academics, athletics, or extracurricular clubs.